This article by Jared Phillips, Fightback member, was originally published by the Socialist Party of Australia. Workers in Aotearoa/NZ are applying in large numbers for scarce jobs, large-scale redundancies are becoming more frequent, record numbers of people are leaving the country, and the government is putting tougher tests on welfare recipients. In a nutshell there are not enough jobs to go around and the National Party led government is placing the burden on ordinary people who were in no way responsible for this crisis. At the end of the third quarter of 2012 the rate of unemployment was at 7.3% which is the highest rate recorded in Aotearoa/NZ since 1991. The number of officially unemployed had risen by 13,000 on the previous quarter. Youth unemployment was disproportionately high at 17.1%. Last month 1600 people applied for 80 positions at a new supermarket in Blenheim, a town in the South Island. This is not uncommon. In Christchurch 1000 people applied for 170 new supermarket jobs last September. Also last year, a supermarket was still under construction in the city of Palmerston North when 600 people gave in applications at other locations of the supermarket chain. A manager reported that job applications were going in “before we even turned the dirt at the new store”. 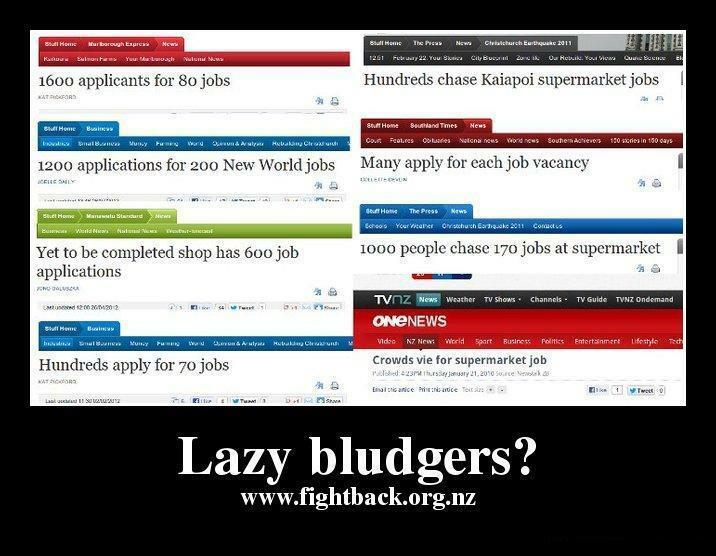 This illustrates that workers in Aotearoa/NZ are job-starved and desperate for work. The core productive sectors of the economy have been through a prolonged downsizing since privatisation and other neo-liberal policies were introduced in the 1980s but there has been a new spike in redundancies as result of the recent economic crisis. Already in 2013 large scale redundancies have been carried out with NZ Post announcing 100 lay-offs, Mainzeal construction (one of the larger construction firms in NZ) going bankrupt leaving at least 200 workers redundant, Contact Energy announcing its intention to strip-back its 1100 workforce by 10%, Summit Wool Spinners announcing 192 redundancies and Norske Skog announcing 110 redundancies at Tasman Pulp and Paper. These redundancies follow on from redundancies last year at KiwiRail, Solid Energy, and New Zealand Aluminium Smelters. Statistics New Zealand has reported that there has been a decline of 17,000 jobs in manufacturing from 257,000 at the end of 2011 to 240,000 at the end of 2012. The jobs crisis is made even more apparent by rising migration to Australia which has also reached record levels. In 2012 alone a massive 53,700 people left Aotearoa/NZ in search of better employment and income opportunities in Australia. This is a rate of almost 5000 per month leaving for Australia. In 2012 the number of Aotearoa/NZ citizens who migrated permanently to another country was up 30,000 on the number that migrated in 2002. This masks the true extent of the jobs crisis as the number of people leaving the country is not recorded in the unemployment figures. At the same time as unemployment is being forced onto an increasing share of the population the National-led government has continued to make life more difficult for those without work. In 2011 the National Party announced it had made – what were in effect – over $17 million in cuts to unemployment benefits over the previous year. It did so by introducing its Future Focus policy package which required unemployment benefit recipients to reapply for their benefits annually. This led to 5000 people not reapplying and the cancellation of 9200 benefits over the same period. The policy requiring annual reapplication was also pushed on to sickness beneficiaries and led to the cancellation of 900 sickness benefits. In the cases of both unemployed and sickness beneficiaries there was no increase in employment to match the cancelled benefits, meaning that the cuts directly intensified hardship. Future Focus also had a strong emphasis on negatively targeting sole parents – mostly women – as it sought to curb Domestic Purposes Benefit (DPB) entitlements. Specifically DPB recipients now have their benefits cancelled for failure to look for part-time work when a child reaches the age of six. National announced that in the first phase of its so-called welfare reform it expanded work testing from 25% of beneficiaries to 36%. At the same time those receiving benefits fell from 345,000 to 328,000, and – as already pointed out – there was no corresponding job growth. Last year the government went into a further phase of attacking the civil liberties of unemployed women and youth in particular. Women on benefits and daughters of women on benefits (between the age of 16 and 19) have been targeted by a scheme which provides grants for long-acting reversible contraceptives. Socialists agree with the provision of free contraception for all. However, we resolutely oppose the idea that any particular section of society should be targeted and impliedly labelled by the state as being less fit for reproduction. As anti-poverty campaigners have pointed out, if the government wanted to fulfil social obligations and improve access to contraception then the already existing family planning centres would have received additional funding. On the contrary it is not ruled out that some family planning centres, which provide universal free or subsidised contraception, will lose funding as District Health Boards look to make cuts. Since 2012 unemployed youth have been channelled through a new Youth Service which serves the purpose of tightening the obligations to be met by unemployed youth if they are to continue receiving a benefit. Youth Service manages individual weekly entitlements by forwarding money directly to landlords and power companies, and any left-over balances are credited to cards that can only be used on a limited range of items, such as food at supermarkets. Many of these measures mimic the discriminatory laws that have been used against Aboriginal people in the Northern Territory of Australia. That the government will go to such surreal lengths to curb youth welfare entitlements instead of creating socially useful jobs for young people on a planned basis is indicative of the depth of the unemployment problem. It also shows that capitalism as a system is incapable of offering any real solutions. One controversial policy implemented last year prescribes that a person’s benefit can be cut if he or she has obligations to look for work but fails to apply for jobs which have drug testing in the recruitment process. People with drug-related issues need social and medical help rather than being forced further into poverty. Another is that the Ministry of Social Development now has the power to cut the benefit of any person who has an outstanding warrant for arrest and who has not presented to police within a week of receiving notice from Work and Income New Zealand. Overall these policies have the socially destructive effect of portraying all unemployed people as being criminal or having drug issues. These policies also hurt the families and particularly the children of the people in question. The National Party led government’s only solution for reinvigorating economic growth in Aotearoa/NZ is to punish the victims of this jobs crisis. Public spending cuts, public asset sales and wage restraint goes side by side with tax cuts to the rich. As has been seen in Europe, far from helping, these measures have only made the crisis deeper. Socialists argue that everyone should have the right to work. We fight for a system that provides jobs to all those who can work and a living wage to those who can’t. Full employment could be achieved by shortening the working week, without a loss in pay, and sharing out the work. Thousands more jobs could be created by initiating a massive public works program that focused on building the things that society needs like more housing and public transport and an expansion of public health, and education. At the end of the day it is the profit driven system of capitalism that creates unemployment. Side by side with fighting against redundancies, for more jobs and for decent welfare, trade unions, progressive community groups and socialists need to fight for a system that prioritises people’s needs. Socialist solutions exist which could be done starting tomorrow – there is no need to wait for government. They would ameliorate a great deal of suffering, and would go a long way toward creating a revival in socialism in this country. Yes we agree that socialists should always be fighting for reforms and most if not all of our members are involved in the struggle for reforms whether it be over wages, GLBT issues, etc, etc. If anyone has led you to believe that we don’t participate in the fight for reforms then I’d ask if you could take a deeper or more informed look. However we also recognise that ultimately the problems of the working class and other oppressed people can’t be resolved within the confines of capitalism so ofcourse it’s important to keep putting that forward in our analysis. On the issue of the role of left unity, I think that is up for debate becuase it is quite complex. Even in Fightback there would be a range of views on the question of what type of left unity is needed. I think everyone in Fightback agrees that work in Mana and in Unite are important areas of left-wing unity in practice. As are some single issue campaigns that materialise from time to time. Perhaps different to some people in Fightback I don’t emphasise the merging of left-wing groups unless there is some enough agreement on quite specific political perspectives. There are an enourmous number of examples where sacrificing politcal prinicples for the sake of a patched-up unity have resulted only in A) further splits and B) loss of a Marxist perspective in favour of a gradualist/reformist perspective. While we agree with working with gradualist refromists on issues, we don’t think that Marxism should be sacrificed to get there, or the necceaary revloutionary perspective is lost. In my view the main problem of secatrianism is not that between groups but that between parts of the left on one side and the daily struggles of working class and ordinary people on the other side. Which comes back to the first point – that we agree that socialists have to be involved in day to day struggles of the class. And again on a prior theme of this little post, I think Mana and Unite are projects that help the left which calls itself socialist work on the day-to-day issues. I think this is true of both our organisations and I often enjoy joint-work with SA comrades that arises from Mana and Unite participation. I also disagree with your nuance in regard to ‘leading lights’. Ofcourse Fightback are not anarchists who dismiss the role of leadership and we are certain that history will continue to throw up exceptional working class leaders. However I think the nuance should be more on “party-building” rather than leading ligths of different organisatipons etc getting together. In our view a party-building approach is essential so there are whole organisations of members – not individual leaders – who are capable of synthesising working class and revoluitionary experience and intervening in the forthcoming battles to connect those to revolutionary socialist objectives. So yeah, I guess that’s a bit of feedback on your resposne. Cheers, Jared. Linda, I don’t know if you follow things in Australia much, but there is something going on there which indicates that it is possible for far-left groups to put the struggle first and unite. There is currently a merger process going on between Socialist Alternative (SA) which is by far the largest Marxist group and the Revolutionary Socialist Party (RSP) which is much smaller but consists largely of people with 30, 40 and more years of experience in a wide range of political and industrial struggles. The RSP leaders and the older leaders of SA have been political opponents and rivals, often bitterly so, over three, almost four decades. Yet they have been able to put aside those historic disputes and merge because they put the class struggle and revolutionary unity first. In New Zealand there is a situation where three far left groups – FB, SA and ISO – are all involved in a party-building project with reformists and also with a layer of people who don’t even identify as left, namely the Mana Party project, and yet they can’t engage in an organisation-building project with each other. The differences between FB, SA and ISO are much smaller than the differences they have with other people in Mana Party, so they *should* be able to unite as a single far-left organisation. Parties aren’t built by one particular tendency sticking up its flag and then trying to recruit to itself. That’s just tendency-building or sect-building. It’s what US Marxist Louis Proyect, who has researched a lot on Bolshevik history and party-building, calls the “small shopkeeper” approach, where each group lays out its wares and tries to attract more custom than its rivals. In that light, it will be interesting to see how other left groups in Australia respond to attempts by the merged Socialist Alternative organisation to unite more of the revolutionary left in Australia. Will other groups adopt a partyist approach or be sectarian to that project. But, certainly, in New Zealand, it would make sense for FB, SA and ISO to create a common organisation. Seriously Phil. You call everyone else ‘the swamp left’ and generally abuse and antagonise everyone about also everything. Funny enough, you theorised the SWO splitting along radical/reformist lines and when it did you continue hassling them as if nothing has changed, just because it didn’t happen when you were in charge. You are the barrier to Left Unity that you are describing. Seriously. If more people cared you could become a meme to rival Stalinicos. Joel, this is about the fourth or fifth time you have posted personal abuse in relation to me instead of engaging political arguments. If you can’t engage in a *political discussion*, perhaps you just not bother posting. Maybe I needed to get some frustration out of my system. You’re a hypocrite and one of the people on the radical left with the least ability to lecture people on “left unity” and “sectarianism”. You have an ahistorical perspective on this issue that is also uninformed and thereby quite useless in any practical sense. My problem is that I took you quite seriously and find it dispiriting in a minor way that no matter what happens you’re going to be floating about like the skeleton of the Alliance being an online nuisance, saying the same stuff you’re saying now. Thank you Jared and Phil for your replies. They were both excellent. The sense of frustration and irritation that I know I often express here and elsewhere is due to my cogniscence of the real suffering that people are experiencing now, even while we debate. Everywhere, in the midst of this crisis, I see good ideas like yours still-born, for lack of unity, lack of support in the general populace, and a strange reluctance to pick up the arms our enemies drop at our feet and use them in our own struggle. What I see is that we as Socialists purport to have solutions to problems that plague humanity, and we do. Yet in a crisis like this, when humanity should be flocking to us, we can’t get 20 people in a room. We must clearly be doing something very very wrong. I know this, because last night, I was in a packed auditorium listening to Hordur Torfason speak on his part in the “Icelandic Revolution”. Interest in Revolutionary ideas is high, but we see no corresponding increase in our support. This demands explanation. People will naturally come to anyone who is offering them what they want. So if we cannot pack a room with strangers, then we must not be offering people what they want. We are standing on the sidelines of history, not because our ideas are bad, but because we do not know how to make them stick. We are viewed as passe, irrelevant, Jurrassic curiosities having nothing to offer. Worse than that, we often will not be told, not by anyone, least of all by someone without an ideological pedagree more impressive than our own. We insist as Phil said, on running our own little shop fronts, watching the Revolution pass us by from behind our empty till, surrounded by empty shelves. Would that we had a plan! But all we seem to have are ineffective tactics that the State developed immunity to long ago. We still do them for lack of any better ideas, even though the arrests mount, and we burn through activists at a shocking rate. For all this, to the millions who need us, we offer no warmth, no solace, no comfort. We are a vessel filled with dry paper covered with outmoded ideas. A world cries out for us to do something. Thousands quietly commit suicide every day, or slip into Hoovervilles the main stream media refuses to acknowlege, and we stand around arguing, or doing the same small actions we’ve always done. I hear those cries! I have heard those cries before, in the stories my mother told me from the Great Depression. I cannot stand by and debate while this goes on, knowing what is happening. And quoting a hundred dead Marxists won’t make me ignore them. I consider that I am on the downhill run in my life, and time is precious. I am fast approaching the point where I no longer care who I have to shame or call out if it means something is done before I die or we all slip into Totalitarianism. I am not talking about reform. I am saying that we are few, and we are poor because we do not offer people what they want. People are not stupid, they do not congregate around dry wells. When we start demonstrating our socialism by our deeds, and create socialist institututions that show at least a glimpse of what a socialist society would be like, people will flock to us. Then, we will have all of the helpers, and the resources we will need for any project we can conceive. Our solutions must out-compete the capitalist alternatives. And they do, when they are well-run, we need have no fear. But we must create them first, and we must run them well. This is not utopianism, or reformism, or gradualism, this is practicalism. This is Socialism in action. This is the politics of the stomach. No doubt I am offending some precept of which I am not aware, but I no longer care. Are any of us prepared to stand by and let people suffer and die for a scrap of dogma? These ideas we hold are important, no doubt. But not so important as even one human life. And that is the standard I apply to everything now, as this crisis deepens. Time is passing us by. We must put aside our differences, and together, question everything we are doing that is not getting the expected result. This, of all that we could do, is the one thing the State fears most. Agreed that many of the differences between socialist groups are not in fact differences of principle. There are some differences of principle; for example groups that shelter abusive men. There are also some historical differences. Fightback is not part of a “tendency,” we do not demand all of our members share the exact same historical analysis. But as I’m sure we’re all aware, the practice of unity is not simple. It’s achievable as a starting point through practical work in broader campaigns, on the sort of immediate bread and butter issues Linda is talking about. Fightback’s strongest branch is in Wellington, while Socialist Aotearoa is based mainly in Auckland, so there’s not much of a practical basis for regularly working with Socialist Aoteoaroa on joint campaigns. However in Auckland Fightback and SA have worked together in Unite. At our annual public conferences, we also invite both ISO and SA to speak. When the Anti-Capitalist Alliance was formed, the original WP group was based in Auckland and the Revo people were based in Christchurch. That was no barrier at all to working together and, after a period of joint work, we merged. It happened because there was a will to work together and try to draw others in – for instance, we put an effort into trying to get ISO to come into the ACA. Because we worked together so well – I’m talking about the original WP and Revo people – we merged into a single organisation. But it required taking the initative and having the will to move along that path. That’s what’s happened in Australia with the SA-RSP merger. And, of course, they will end up with something that is more than its parts. But in the mid 90’s you didn’t know each other existed, or at east the Workers Party in its Ray Nunes led incarnation didn’t. There was a period of time (a couple of years?) were contact was made and communication started, it’s not just a matter of will, there’s also a question of material conditions that aid the process. While unity remains a theoretical construct it poses a much more abstract and distant proposition than a unity built in practice. I don’t think that it’s a coincidence that the WP-Revo merger was built during the period of the anti-Iraq War struggle. >Maybe I needed to get some frustration out of my system. “You have an ahistorical perspective on this issue that is also uninformed and thereby quite useless in any practical sense. Joel, this is just further personal abuse. Anyone can read back on this thread and the one from last week and see the only personalised abuse was on your part. Four entirely personalised abuse posts in one week, all without any comment by the moderators. Me pointing out that you are engaging in personal abuse rather than political discussion hardly constitutes “spitting the pip”. Calling someone a hypocrite, instead of engaging in a political discussion, is also personalised abuse. Since I was one of the people integrally involved in the original WP-Revo merger, am a supporter of the SA-RSP merger and have been an advocate of a merger of left forces in another country where I have involvements, your claims don’t stack up. Since you’ve finally posted something that is relevant to the actual discussion at hand, I’ll take up what you say above. Yes, sure, it was in the context of the anti-war stuff that WP and Revo became aware of each other. But ISO, FB and SA have been aware of each other for years. In the early days of the ACA we tried to involve ISO as well. We hoped for the three groups to come together, but ISO preferred not to be part of the ACA despite two years of our trying to get them to come in. Several independents even put out a public letter calling on the ACA and ISO to come together. We said yeh, sure, they didn’t and those two independents joined the ACA as a result. In the context of the anti-Iraq War movement, both the original WP and Revo groups could’ve easily taken the sectarian position that since there were more people on the streets we could grow and recruit to our own stalls. But we didn’t. Despite coming from very different political backgrounds, we started working together and merged. If FB, SA and ISO can work with non-revolutionaries (including some people who don’t even identify as left-wing in any way) in a party-building project (Mana), then the question remains: why not build a common organisation uniting FB, SA and ISO. And, just to make things crystal clear, it takes three to do this, so it would take ISO and SA to get on board. But someone could get the ball rolling. PS: Ian, take a look at the article in Marxist Left Review. It’s very interesting. This is unfortunate, because it was a potentially useful discussion. A little bit of moderation of the comments section could have kept it on-topic.